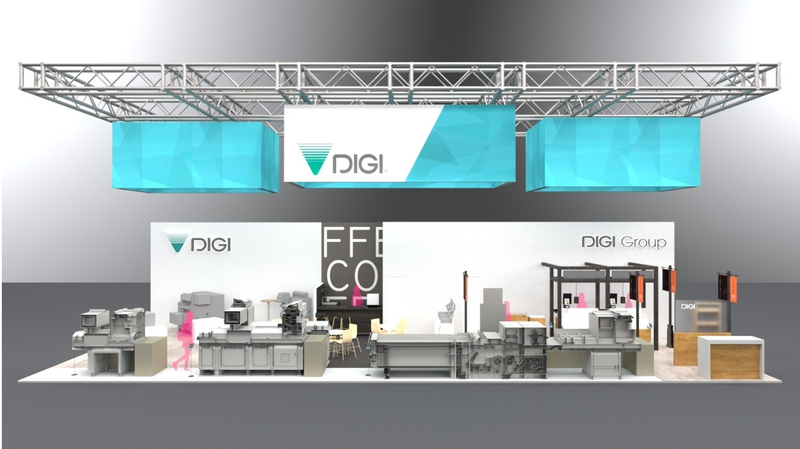 DIGI will be exhibiting several exciting solutions for the food and retail industry at IFFA 2019. IFFA, known as the leading international trade fair for the meat industry, will be held May 4-9, 2019 at Messe Frankfurt in Frankfurt, Germany. New Product! PW-100 – A fully-automated high-speed vegetable flow wrapper that is especially suitable for packing elongated and leafy vegetables. Advanced length-sensing technology ensures accurate and speedy packing. This product has a number of features that reduce packing errors and lock in freshness for a shelf-ready product. New Product! HI-700 HS –This labeller is our fastest machine yet, boasting speeds of up to 160ppm. The machine has had many upgrades both internally and externally to improve pack transition, weight stability, and accurate label placement. New Product! MI-700 MS – This labelling solution has had an all-round makeover, with a new brushed steel frame and latch release conveyors. The compact, singular MI-700 can reach speeds of up to 100ppm. New Product! LI-700D LS – The LI-700D LS being shown at IFFA is a long scale version, designed to be partnered with the PW-100 wrapper. The LI-700D LS has been fitted with a linerless labeller which reduces paper waste and helps to reduce environmental impact. Like the others labellers, the LI-700D LS has been updated with new external and internal features and can reach speeds of up to 65ppm with a standard scale length. New Product! AW-5600ATII with Automatic Infeed – This solution meets demanding output by in-line operation, capable of applying three labels on one tray at a time. DIGI’s unique features of Auto-Tray sizing and Super-Stretch enhance efficient operation for various items. New Product! RGW-560II – A new concept in banding machines that showcases the product while still offering information and secure packaging. The flexible product strap eliminates the need for distracting labels, allowing for a better package design that is more appealing to customers. AW-5600FXII – Focusing on flexibility, the AW-5600FXII automatically wraps items with or without trays. LI-5600 Automatic Weigh-Label System – Label system with compact design that can be integrated with existing equipment in the pre-packing area. New solution! DIGI Shop&Go – Shoppers download the DIGI Shop&Go app on their smartphones and scan items as they shop in the store. They can then proceed to the self payment station, choose their payment method, and checkout. Shoppers will be happy to skip the checkout lines! New product! RM-90 – This price computing scale displays a QR code that shoppers can scan with their smartphone to receive a digital order summary. With no printer head, you'll save money on consumables and won't have to worry about costly maintenance or replacements. The tilting display ensures that both operators and shoppers can interact with the scale with ease. Combine with DIGI Shop&Go to seamlessly integrate weighed items. New product! RM-5800EL – A POS scale that provides complete POS functions along with weighing and floating clerk functions, the best solution for butchers. WEB-3000B Self Payment Station – This self payment station is part of DIGI Shop&Go, a solution where shoppers scan items in the store as they shop. The payment station is where shoppers can view their purchase information before selecting a payment method and checking out. Includes ITL recycler and is supported by @Label Cloud and Shop&Go Cloud. SM-6000EV – is a revolutionary PC-based scale with several built-in solutions that redesign the user experience. It can be integrated with DIGI Shop&Go. SM-6000EV PLUS OP– A variant of SM-6000 with a 15-inch high contrast color customer display. This helps retailers generate additional revenue and brand awareness by displaying promotional videos such as recipe ideas. InfoTag (ESL) – DIGI's Electronic Shelf Labels (ESL) comes with NFC, LED blinking, and product finder solutions, and can be integrated with DIGI Shop&Go. RM-5800EVEL-B – Another version of POS scale that provides printing function in prepack mode in the store. SM-5300EV PLUS – PC-based scale with linerless labels and auto-cut. The interactive 7-inch color customer display can present advertisements to drive sales and enhance customer service. Connects to InfoTag and e.Label.